Earn to Save in order to Retire Earlier and Richer. Earn to save is the first step to financial independence. Wealth creation starts with saving! In order to build wealth and invest for your retirement you need to earn to save and start accumulating income generating assets and surplus capital. "Now that’s a really useful website! I’m probably not the atypical reader but I’ve sent the link to my son and a couple of others that I think would really benefit from the info." In general, from your early to mid 40’s, once people have got (most of) their spending and debt under control, you may want to start to use (some of) your 'surplus' earnings to save and invest for retirement. Without noticing, you have entered the "earn to save phase", i.e. 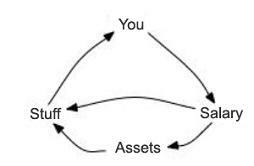 the phase of your financial life cycle when you start to accumulate wealth. Make sure to take full advantage of income tax protected vehicles like a Cash-only ISA. More about ISA tax benefits. Investing is ultimately about escaping the need for a salary. Initially though, as you only have secured some assets, other people will not be paying you enough money to cover your current and near future spending. To increase your future cash flow, you will need more income generating assets. It is really amazing how fast your accumulated capital can grow, especially if you are getting a good rate of return. For instance, a 7 per cent return will almost double your money in 10 years. Prudent early retirement investors can do even much better than 7 per cent over the long term. Financial independence in sight. . . .
You become financially independent once your assets provide you with sufficient cash to cover all your current and future “stuff”. It does you no good, however, if your sole asset is your house –mortgage free– or if your money is sitting in a savings account if they provide little income. How many people do you know who became a millionaire with putting money into savings accounts? Nevertheless, as time passes by, you are about to enter the next stage of your financial life cycle: the Retire Earlier and Richer stage.